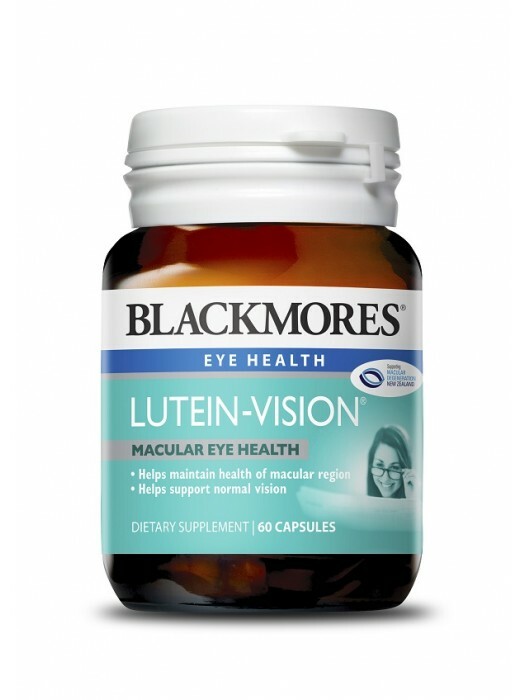 Blackmores Lutein-Vision™ is an antioxidant formula for maintaining eye health. It helps to maintain and protect health of macular region and increases density of the macular pigment in the eye to maintain good eyesight and improve visual sharpness. In the macula, lutein and zeaxanthin naturally form a layer of yellow pigments called the macular pigments, which serves as an effective natural filter of the most damaging light (near-to-UV blue light) that reaches the retina. Supplements containing natural lutein and zeaxanthin esters have been shown in human trials to increase the density of the macular pigments. Higher macular pigment density is associated with healthier eyes and the retention of youthful visual sensitivity. In addition to absorbing potentially harmful light, lutein and zeaxanthin also function as antioxidants and may help slow down age-related visual loss by decreasing the life-long cumulative effects of oxidative damage to the retina and lens. Lutein-Vision™ also contains selenium as selenomethionine, an easily absorbed form of selenium. Selenium has an important antioxidant function in the eye as part of an antioxidant enzyme called glutathione peroxidase (GSH). GSH is concentrated in the lens where it has an important role in preserving the clarity of the lens and preserving healthy eye function.